Fill out the form below to have the Magnolia Blossom contact you with a quote, and with more information! What could be more romantic than a wedding on the mighty Mississippi river beneath the warm sun, surrounded by three thousand acres of pristine park land steeped in historic beauty, on board a quaint Victorian styled paddle boat? If this picturesque setting sounds appealing to you, you’re not alone! Many couples are discovering the advantages the “Magnolia Blossom” has to offer for their wedding ceremony. 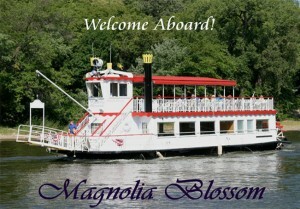 From your choice of destinations, exciting on board activities and entertainment, to the legendary service and cuisine*, the “Magnolia Blossom” can be an all-inclusive and wonderful way to start and celebrate your marriage.